Presenting a handcrafted key with birthstone Christmas tree ornament with authentic Swarovski rhinestones. Makes a perfect gift for birthdays. Please note: Also available with the following monthly birthstones: Garnet, Amethyst, Aquamarine, Diamond, Emerald, Pearl, Ruby, Peridot, Sapphire, Topaz, or Blue Zircon crystal birthstone. When ordering make sure to specify MONTH/BIRTHSTONE and COLOR. Ornament shown in white pearl with October birthstone - Rose Zircon. Choose from 20 assorted solid colors when you add the item to your cart. 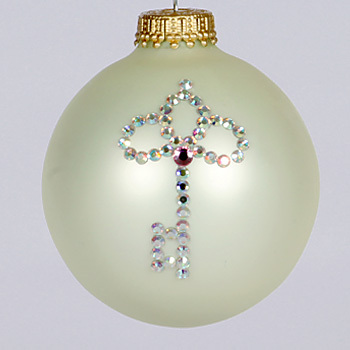 Decorative key with birthstone and birthstone key Christmas tree ornaments made with genuine Swarovski rhinestones can be purchased at Designer Ornaments.